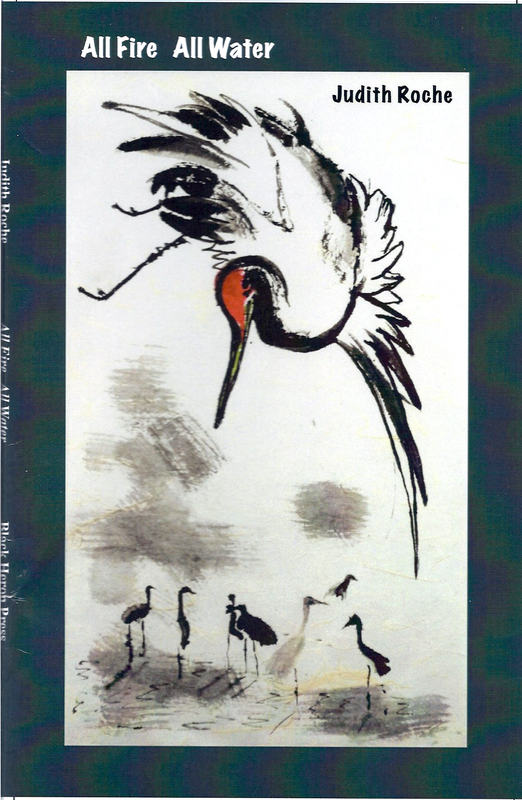 “Judith Roche’s fourth collection of poems, All Fire All Water, consists of four parts. “Rivers Have Memories,” the first part, explores nature and our relationship to it. Poems include fish and birds, bees and wolves, storms and the changing of the seasons. Drawing from the Salish Sea, where Roche lives, the Pacific Ocean, and the northern Great Lakes, these poems are steeped in water. But there’s plenty of the fire of passion in this collection as well. In “A Bird Caught in the Throat,” Roche turns to “The Face of War” and the horrors of unnecessary suffering; e.g., the “blood for oil” the 20th and 21st century have brought us. She writes of a usually well-intentioned friend from her liberal church who says she would torture those who are cruel to animals. In “Hoffa” she invokes a childhood memory of the unthinking pain adults can inflict on children, in this case, James Hoffa (the son, not his famous father) in the 11th grade. In “The Husbands Sweet,” a play on suite, she looks back from a great distance to a marriage both painful and beloved. These poems are in turn ironic, playful, rueful, and humorous, but still keep all of the sorrow intact. There are poems of other assignations after the bitter breakup of the marriage. “I have been a fan of Judith Roche’s poetry for several decades, and All Fire All Water is an absolutely brilliant collection. Here the poet brings together her years of unique life experiences with a genuine love and understanding of nature and ecology. There are nature poems here that would grab John Muir’s, Rachel Carson’s and Edward Abbey’s attention and imaginations. There are also insightful, satirical poems that are thought-provoking and sophisticated in their bitter-sweet sad humor. These poems are both significant and beautiful. If poetry collections were to be compared to popular music, then this is Judith Roche’s Sergeant Pepper.” —M.L. Liebler, poet and editor of Working Words.